I've always been a CompactFlash person. I've got CompactFlash cards all over my house...at least 5 or 6 of them. My Digital Cameras use them; I've pretty much standardized on CF as my personal format. I figured that I'd never see another format in my house. Then, in the space of about 2 months, my wife got a Sony Clie (which included a Memory Stick) and I got a Sony Digital8 Camcorder (also included a Memory Stick). So, suddenly, I've got a more than one memory format in the house. What to do? My wife is taking digital still photos with the Sony Camcorder and viewing them on her Sony. You have to admit, it's a pretty cute little stick. Now, enter the MemPlug MS. I've always liked what the guys at Portable Innovation have been doing. 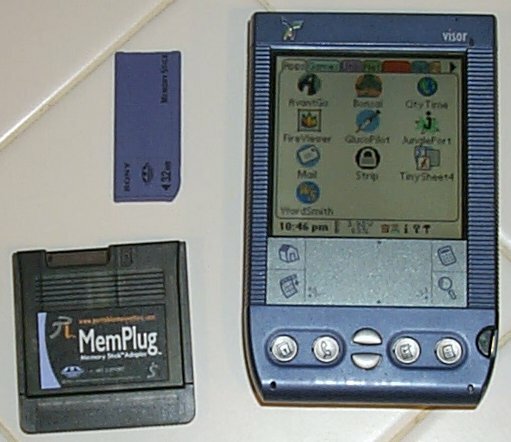 I was impressed with the MemPlug for SmartMedia, and I use the MemPlug for CompactFlash all the time. The software suite is tight and works great with no thought on my part. I had high expectations for the MemPlug MS. Since I've seen first hand how tightly integrated the Memory Stick is in my wife's Sony Clie, I was interested to see how smoothly 3rd party software would work with my Visor Prism. The Sony Clie's have a build in Memory Stick slot slightly off center in the top above the screen. They also include gMovie for making tiny videos for viewing on your PDA. Sony doesn't include Backup Software though, so right off the bat the MemPlug was looking pretty good.